We’d love your help. Let us know what’s wrong with this preview of Strength Training by NSCA: National Strength and Conditioning Association. Millions of people want to add muscle, get stronger, and look fit as a result. But when they look for expert guidance, they face a sea of self-proclaimed fitness gurus who say they have a can't-miss program for fast and easy results. So where do you look for solid, no-nonsense advice you can trust from true experts in the strength training field? Inside this book! 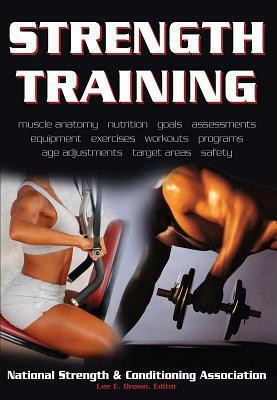 Written b Millions of people want to add muscle, get stronger, and look fit as a result. But when they look for expert guidance, they face a sea of self-proclaimed fitness gurus who say they have a can't-miss program for fast and easy results. So where do you look for solid, no-nonsense advice you can trust from true experts in the strength training field? Inside this book! The NSCA is the worldwide authority in the field of strength and conditioning, serving 33,000 members from the sport science, athletic, allied health, and fitness industries. Now, the proven techniques developed and honed by these leading authorities are available to you! To ask other readers questions about Strength Training, please sign up. Good read, in depth explanations of how and why muscles work, and grow.